The medium black heated hoodie is powered by the M12 REDLITHIUM battery. Each heated hoodie uses carbon fiber heating elements to create and distribute heat to the chest and back. A single touch LED controller heats up the battery heated hoodie to three heat settings. This MILWAUKEE heated hoodie kit has a new Quick-Heat funtion that allows you to feel heat three times faster than our previous hoodies and market competitors. The hooded sweatshirts are built with a durable cotton/polyester exterior and waffle weave thermal lining. This provides a versatile three-season solution to keep heat trapped in without bulky additional layers. The large black heated hoodie kit is powered by the M12 REDLITHIUM battery. Each heated hoodie uses carbon fiber heating elements to create and distribute heat to the chest and back. A single touch LED controller heats up the battery heated hoodie to three heat settings. This MILWAUKEE heated hoodie kit has a new Quick-Heat funtion that allows you to feel heat three times faster than our previous hoodies and market competitors. The hooded sweatshirts are built with a durable cotton/polyester exterior and waffle weave thermal lining. This provides a versatile three-season solution to keep heat trapped in without bulky additional layers. This kit comes with one heated hoodie, an M12 battery and charger. 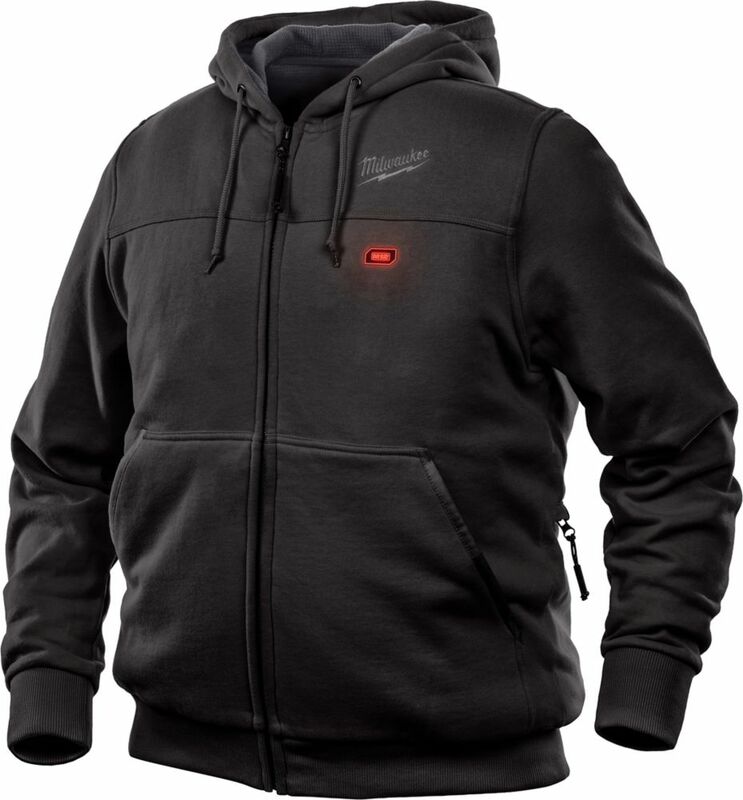 Men's Medium M12 12-Volt Lithium-Ion Cordless Black Heated Hoodie (Tool Only) The medium black heated hoodie is powered by the M12 REDLITHIUM battery. Each heated hoodie uses carbon fiber heating elements to create and distribute heat to the chest and back. A single touch LED controller heats up the battery heated hoodie to three heat settings. This MILWAUKEE heated hoodie kit has a new Quick-Heat funtion that allows you to feel heat three times faster than our previous hoodies and market competitors. The hooded sweatshirts are built with a durable cotton/polyester exterior and waffle weave thermal lining. This provides a versatile three-season solution to keep heat trapped in without bulky additional layers. Men's Medium M12 12-Volt Lithium-Ion Cordless Black Heated Hoodie (Tool Only) is rated 4.2 out of 5 by 16. Rated 5 out of 5 by Mother of Three from Works very well I bought this as a Christmas gift for my Son and he uses it often especially when off-roading. I have seen him use it and have tried it myself. Works good. Rated 4 out of 5 by HomeDepotCustomer from Works well. Produces decent heat.... Works well. Produces decent heat. Rated 4 out of 5 by Paul from Great Hoodie! I have been using the M12 Hoodie for the past few weeks. It doesn't take long for this hoodie to heat up! Downfall is just the battery in the back, tends to get in the way. Rated 4 out of 5 by Pinballken from Well made and warm I bought this 2 months ago, and I really like it. Got it on sale for $99. Works well is very comfortable and heats up almost instantly. I would have given 5 stars, but the battery falls over in the rear pocket and can get in the way and be uncomfortable. Rated 5 out of 5 by david from Milwaukee Heated Hoodie I like this Hoodie because it looks great and you can use it just as a Hoodie or you can plug in the battery to provide some extra warmth.